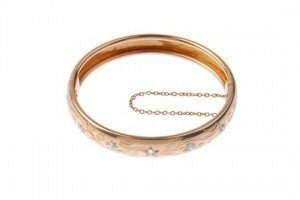 An early 20th century diamond hinged bangle. The front designed as a series of old-cut diamond highlights, to the scrolling floral motif and plain half-bangle. Estimated total diamond weight 0.45ct. An emerald and diamond pendant. 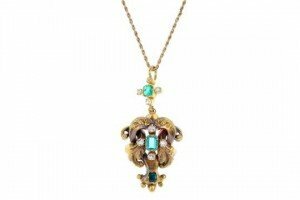 Designed as a scrolling openwork panel, with a rectangular-shape emerald and old-cut diamond quatrefoil centre, to the similarly-set surmount, suspended from a rope-twist chain. Estimated total diamond weight 0.75ct. 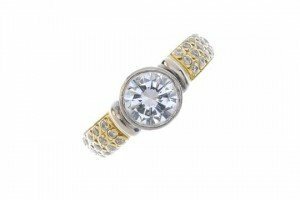 A diamond single-stone ring. The brilliant-cut diamond, within a collet setting, to the colourless paste sides. Estimated diamond weight 1.15cts. A pair of diamond ear clips. 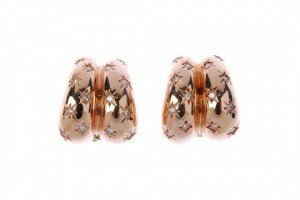 Each designed as two tapered domed lines, inset with brilliant-cut diamond stars. Estimated total diamond weight 0.50ct. A sapphire and diamond bracelet. 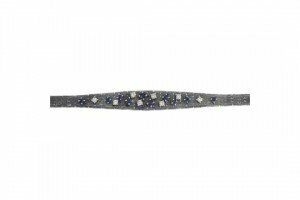 Designed as a series of brilliant-cut diamond and circular-shape sapphires, scattered to the brick-link bracelet, with partially concealed push-piece clasp. Estimated total diamond weight 0.50ct. 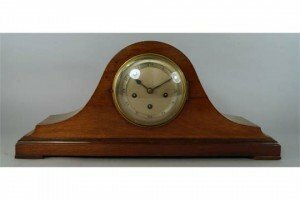 A mahogany Napoleon’s hat type mantel clock, 20th century, with a silvered dial and Arabic numeral chapter ring, the movement with five gong strike. 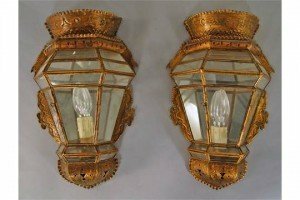 A pair of gilt plate metal wall lights, 20th century, with angled and faceted glass fronts, each with locking doors to front with mirrored plates to backs. 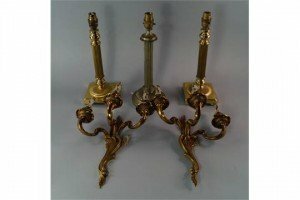 A pair of gilt metal three branch wall lights, 20th century, cast with foliate scrolls, a pair of decorative brass Corinthian column table lamps, a similar example and four associated frosted glass flame moulded shades. 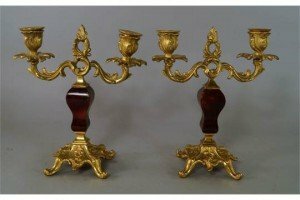 A pair of French two light gilt metal and faux tortoise shell candelabra, 20th century, with foliate cast sconces and leaf form drip pans, on scrolling branches, with waisted square red columns, on foliate scrolling feet. 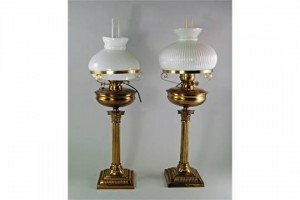 A pair of Victorian brass oil lamp bases, with Corinthian column uprights, on square stepped bases, with scrolling shade supports and glass chimneys, with two different styled shades. 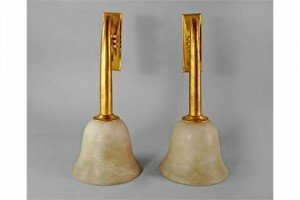 A pair of Jean Pascaud gilt bronze wall appliqués, 1940s, each faceted oblong bracket with tipple ring mount, supporting a scrolled arm and fitted with an alabaster shade of bell form. 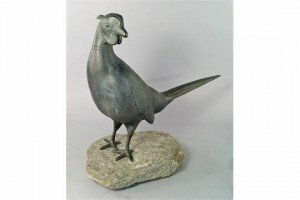 A patinated metal model of a pheasant, 20th century, in the manner of Francois Pompon, standing on a naturalistic granite base. 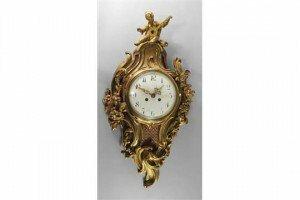 A French ormolu cartel clock, late 19th/early 20th century, the top mounted with a cherub in the Chinoiserie taste playing a lute, the case moulded with C and S scrolls and foliage, with panels of mesh with quatrefoil shaped apertures, the white enamelled dial with Arabic numeral chapter ring, with pierced gilt metal hands, the barrel movement with bell and count wheel strike. 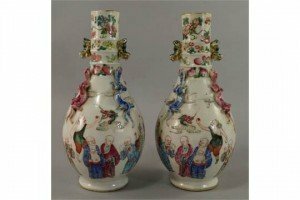 A pair of Chinese bottle vases, 19th century, with ring turned necks, applied with long dragons, painted with dragons and continuous scenes of Immortals. 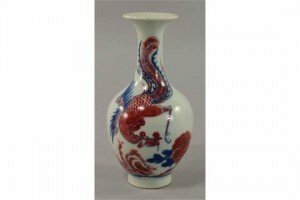 A Chinese porcelain bottle vase, 19th century, decorated with phoenix and rock work with chrysanthemums. A selection of three early 20th century 18ct gold gem-set rings. To include a split pearl five-stone ring with diamond point spacers, a peridot and split pearl ring, together with a synthetic ruby and diamond graduated five-stone ring. 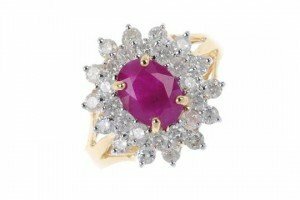 A 9ct gold ruby and diamond cluster ring. The oval-shape ruby, within a brilliant-cut diamond double surround, to the trifurcated shoulders and plain band. Estimated total diamond weight 0.85ct. 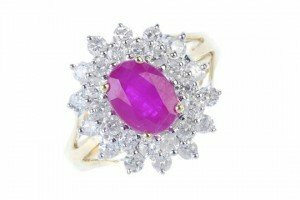 A 9ct gold ruby and diamond dress ring. 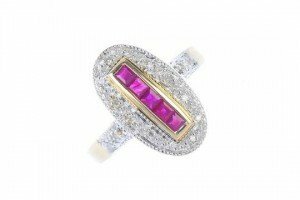 The square-shape ruby line, within a single-cut diamond illusion surround, to the single-cut diamond shoulders and tapered band. 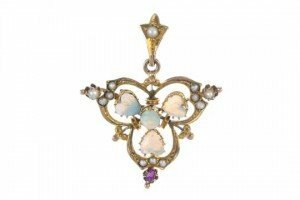 An early 20th century gold opal, split pearl and ruby pendant. The circular and heart-shape opal cabochon cluster, to the split pearl trefoil border with oval-shape ruby accent, suspended from a split pearl tapered surmount. An 18ct gold ruby and diamond cluster ring. The oval-shape ruby, within a brilliant-cut diamond double surround, to the trifurcated shoulders and tapered band. Estimated total diamond weight 1ct.